This is my review of the new iPhone and iPad first person shooter from Activision called Call of Duty: Black Ops Zombies. Treyarch has made a few mishaps as far as the Call of Duty series is concerned, but Nazi Zombies was certainly one of the better ideas they’ve ever contributed. 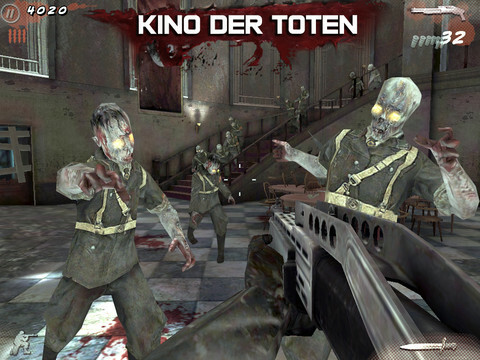 After they developed the original Call of Duty: Zombies iPhone app, they introduced a sequel in the form of Call of Duty: Black Ops Zombies, dutifully titled after the mini-game in the console version. For those who aren’t aware, Zombies is a separate game mode in both the World at War and Black Ops entries of the Call of Duty series. 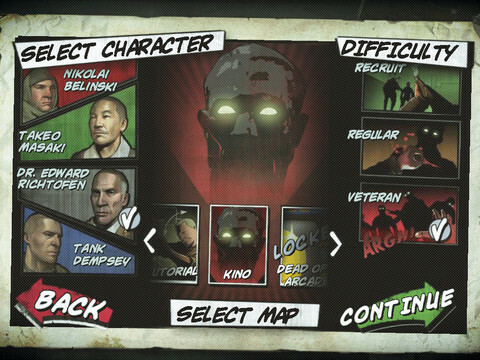 The purpose is to fight against an increasingly difficult horde of zombies for as many rounds as possible. There are windows where they can enter the building, and you must barricade them while keeping an eye on your back. Everything from barricading to defeating zombies gives you points, the in-game currency that lets you get new traps, ammo, weapons and reveal hidden parts of the map. New areas give you stronger weapons to fight against stronger zombies, but that means more places for zombies to enter. There’s plenty of strategy involved as far as spending your points and how to keep your defenses up. While you have the occasional grenade, it doesn’t defeat zombies so much as amputate them and slow them down. Aiming down the iron sights increases accuracy but slows you down too much. 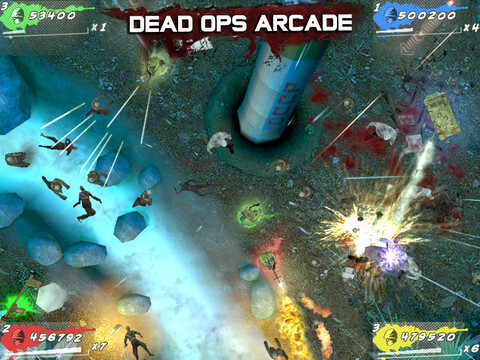 Often, zombies drop power-ups, like multipliers and insta-kills. Overall, the concept is very fun; not only was this arguably the most popular mini-game in the entire Call of Duty series, but bringing it to the iPhone, iPad and iPod Touch makes the fun portable too. The optional tutorial is there to help you familiarize yourself with the controls, and right away there are both some bonuses and some issues. First, the graphics are sharp and crisp, about on-par with any other application made by a major developer, such as with Infinity Blade. The only real complaint as far as graphics are concerned is the tutorial text is really tiny, and the tutorial NPC doesn’t speak, so the tiny text can’t even be glossed over. Updating the app so it features larger text would make an incredible difference. It’s also unfortunate that there’s no voice acting; the audio is very clear and high-quality otherwise, so it’s not like the NPC would have sounded bad. There are three sets of controls to pick from: Dual sticks, touch controls and tilt. Dual sticks are similar to the controls for the console, but they’re the “touch anywhere” sort and can be pretty clunky. It would have been better if there were two physical sticks, such as in Street Fighter IV. The touch controls are possibly the best option, though auto-aiming is a little wonky at times. Tilt controls are also decent, but it will take quite a bit of getting used to. Currently, you can only play on the Kino map, and you can also play the unlockable Dead-Ops Arcade, also from the console, with the promises of more maps from the future. If it is anything like the previous Call of Duty: Zombies title, it will certainly make it worth your purchase — it is already a good price for the amount of fun it provides. This game also works best with the latest version of iOS 5. Players using iOS 4 will likely experience crashes and other similar bugs with this version of Zombies, but Activision will soon release a patch to fix this issue for all users. In the meantime, iOS 4 users would do well to wait before buying this version. Once you do get to buy it, though, it is definitely a great title you will enjoy. AppSafari review of Call of Duty: Black Ops Zombies was written by Darius Reimm on December 9th, 2011 and categorized under Action, Adventure, App Store, Featured, First Person Shooter, Fun, Games, iPad apps, Universal. Page viewed 7525 times, 1 so far today. Need help on using these apps? Please read the Help Page.